Will To Live Founder, and former Red Sox pitcher, John Trautwein dedicates an “Autograph Alley” visit to Fenway Park to his own Life Teammate who lost his daughter to an 8 year battle with Depression this past week. Every year for the past 6 years, I have enjoyed what I call a “Will To Live – Red Sox” weekend in Boston, MA. If you’ve had the wonderful opportunity to visit Fenway Park recently, you will have walked down Yawkey Way, the main street, and the actual “address” of the Red Sox and the center of every game day at Fenway Park. For every single game, all summer long, a Red Sox alum is at the “Yawkey Way Team Store” signing autographs before the game, and every year, I’m always honored to be the “Autograph Alley Guy” signing autographs for hundreds and hundreds of Red Sox nation fans, of all ages, sizes from all over the globe. It’s important to note, that when you talk about Red Sox Alumni – the name John Trautwein is not exactly included with the likes of Ted Williams, Yaz or my old teammates, Dwight Evans, Wade Boggs or Jim Rice. Nevertheless, the people line up through the store and often out into the street to get my autograph each summer – the power of Red Sox nation. When my family lost our son Will to suicide, one of the very first letters of condolences that I received was from the Red Sox, and over the past 6 years, the Sox have been nothing but supportive of the “Life Teammates” cause for Will To Live. On the 100th anniversary of Fenway Park – a Life Teammates wristband was given to every single living Red Sox player in honor of the mission of the Will To Live Foundation. Thus, every time I make my appearance at Autograph Alley, there is always a bag of Life Teammates wristbands with me to hand out to every child who sheepishly comes up and asks me for my autograph. “You a ball player?” I ask – and the answer is always “yes sir”. “Well then take a couple of these wristbands and give them to your teammates, ok? Tell ‘em that you love ‘em and you’re always there for them.” It’s a conversation I’ve had almost daily for 6 years now. The kids always smile and say thanks. Sometimes they ask a question, sometimes the parents will dig a little deeper about the foundation. Even the employees at Autograph Alley often explain the mission of the foundation to the people waiting in line as well. It is always such a wonderful and positive experience for me and the kids, and I truly enjoy doing it. What makes it even more special is that year after year, during the days and weeks after my appearance at Autograph Alley, letters and donations and thank you notes come in, which always warms my heart. This past Saturday, the 17th of September, as the Yanks were doing their pre-game warm up on the beautiful green outfield grass of Fenway Park, I began signing autographs. But this time the purpose was even stronger in my heart. 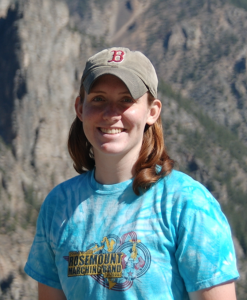 For just four days before, a Life Teammate of my own, someone who had helped me understand the loss of my own son, lost his daughter to the mental illness called depression, something she had valiantly battled for eight years. Christina Stolz, a 23-year-old Boston native had lost her will to live, and now her father Mike, his wife Fran and Christina’s sisters Emily and Kate, had joined what Boston Globe reporter Dan Shaughnessy once told me was “the saddest club on earth.” I was devastated at the news of Christina’ passing. When Mike called to tell me that he had lost his daughter, I sunk to my knees in desperation. I cried for Christina, I cried for Mike and his family, I cried for their friends, and I cried for Will. For the next two days I found myself at the Stolz’ home in Eden Prairie, MN grieving with them, offering the only thing any of us can give them right now – love. They told me, “John, you must do your WTL thing at Fenway this weekend, Christina would love that.” Thus, with every wristband I gave out – with every autograph I signed, my heart cried for this young lady who was now in a place where she was at Peace. Where she was with my son, forming a new “Life Teammate bond” that would give both their families strength. I was shocked, I always sign “love ya man”as part of my autograph, but yesterday in my fragile emotional state, I was simply just signing my name on the Red Sox issued souvenir picture of me in my 1988 uniform. 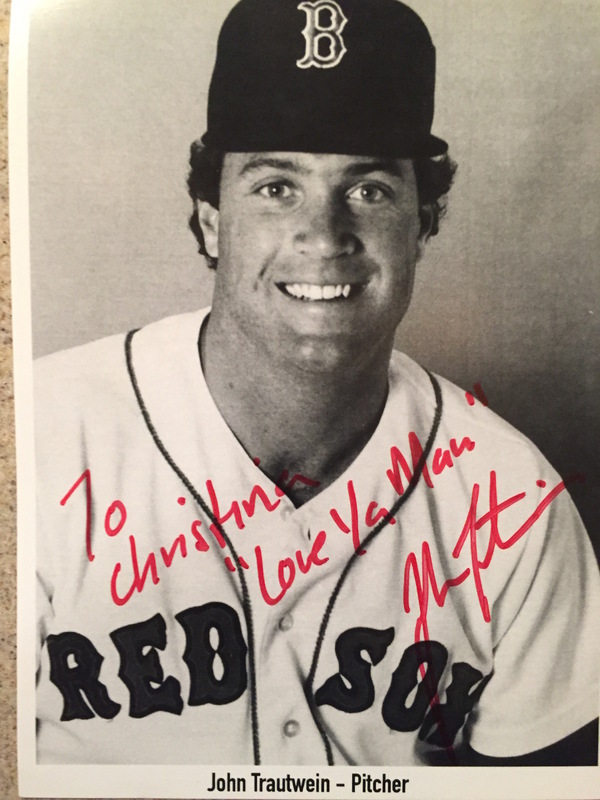 “Of course I will,” I quickly replied and for the next hour – every autograph picture had “love ya man” written across my old Red Sox portrait, in honor of Christina Stolz. This weekend was for my friend – it was for his beautiful daughter – Christina, because life, like baseball, is hard. To me every cheer at Fenway yesterday was for her wonderful loving family and the fabulous support network that is surrounding them with love this weekend and beyond. I learned so well that without friends and loved ones, we don’t get through these tough times. Time will not heal any wounds, love heals the wounds. Love Heals. The last autograph I wrote was to Christina, oh how I wish I could give it to her in person – somehow I think she knows I’m thinking of her, I believe Will told her. To make a donation in honor of Christina Stolz, please click here. What a beautiful story. My heart breaks for your loss and for Mike and Fran. We are family of theirs and are so sad for what they are going through. I hope your memories remain strong. I pray Will and Christina are at pease. This is a beautiful story. I had the pleasure to work with Fran Stolz. She is an amazing woman. I am so sorry for the loss of Christina. The whole Stolz family is in my heart.
. you know Christina would tell you that.